William Bradbridge was born in London in 1501, very little is known about his early life. On 15th July 1528 he was awarded his B.A. at Magdalen College, Oxford with his M.A. following on 6th June 1532 and finally his B.D. on 17th June 1539. Raised as a Protestant, in 1555 Bradbridge was appointed prebendary of Lyme and Holstock Sarum, he was also granted the post of canon of Chichester in 1561 a dispensation was issued regarding a term of residence at Salisbury. On 28th April 1562 Bradbridge was appointed to chancellor of Chichester and he was able to hold the chancellorship with his bishopric. On Low Sunday 1563 he preached the annual Spittal sermon and in the same June he was elected to dean of Salisbury via letters from Queen Elizabeth I. In 1572 Bradbridge was given the Pentateuch to translate for the new Bishop’s Bible. Despite holding a high position within the church Bradbridge he still had trouble with Catholics and dissenters. In 1578 Bradbridge asked Lord Burghley if he could return to Salisbury following trouble in his diocese. 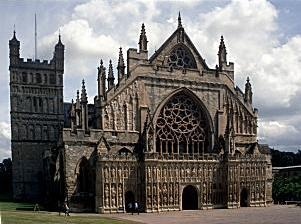 Bradbridge died suddenly on 27th June 1578, aged 77, at his home in Newton Ferrers and was buried in Exeter Cathedral.